Connecting video from CCTV cameras to multiple monitors can be very simple using video distributors and multiplexers. It is very typical for business owners and corporate security officers to require the display of surveillance video on both public and private monitors and also want to record the video to a DVR. At some point, I am sure you have noticed surveillance video being displayed on public monitors such as the ones that can be seen when you walk into a department store and you see yourself on the screen. This is known as a spot monitor. That same camera is most likely also connected to a digital recorder that is recording the video. The camera may also be connected to one or more additional spot monitors. 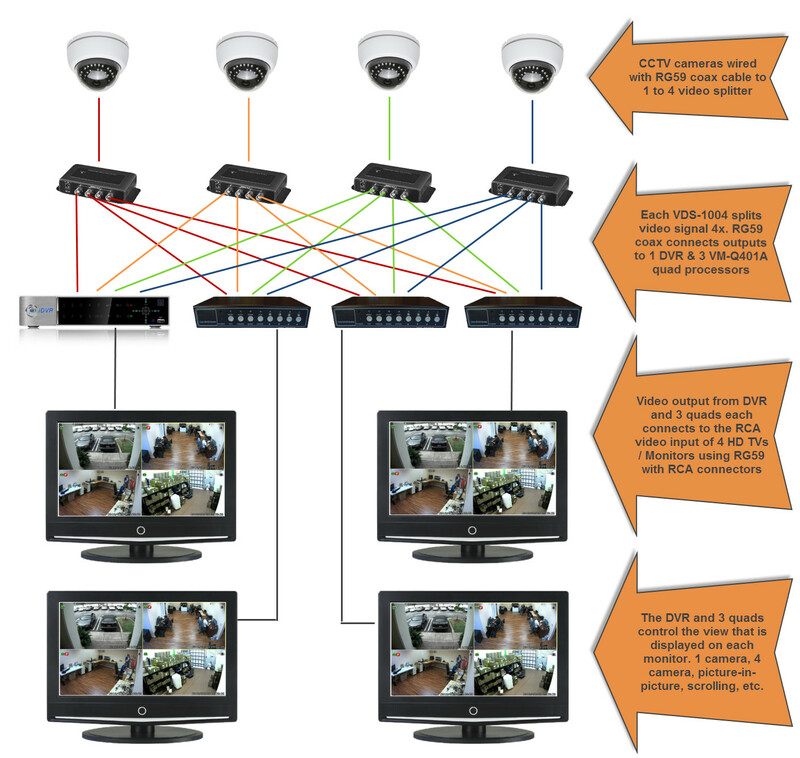 Below is a diagram that illustrates how video from four CCTV cameras can be connected to a DVR and four monitor displays. This diagram was taken from a proposal that CCTV Camera Pros prepared for a customer. This customer was the owner of an auto shop that wanted to allow his customers to watch their vehicles while they were in the waiting area. The owner had the following goals / requirements. Use the existing 4 channel surveillance DVR and 4 CCTV security cameras that were already in place if possible. Install 3 HDTVs to be used as monitor displays in different areas of his shop so that customers could see their cars being worked on. Each monitor must be able to control its own display, meaning that he may want to display 4 cameras on one monitor, 2 on another, and a single camera view on the third. He also wanted this to be easily changeable and independently controlled at the TV location. There would also be a monitor connected to the DVR for administration. He did not want the menu system of the DVR displayed on the other monitors. For example, if he logged into the DVR to play back recorded video footage, the other 3 monitor displayed should not be affected and should continue to display the live video that they were configured to. Below is a diagram that documents the recommendation that we made to this customer. You can click on the image to view the full sized image. Each dome CCTV camera is wired with RG59 coax cable to a VDS-1004 1 to 4 CCTV video distribution / splitter. Each VDS-1004 splits the video signal 4 times and RG59 coax cable connects the outputs to 1 DVR and 3 VM-Q401A quad processors. The VM-Q401A video processors come with an infrared wireless remote so that each display can easily be changed to single camera, dual camera, and quad camera views. Picture-in-picture and single camera scrolling (dwell time) is also supported. RG59 jumper cables can be used to connect the video output from the DVR and 3 quads each connects to the RCA video input of 4 HD TVs / Monitors. A BNC to RCA connector can convert the TV end of the jumper cable.